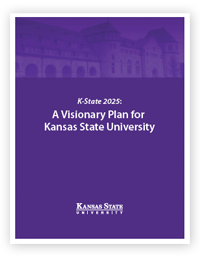 Read about additional K-State 2025 planning initiatives and reports. 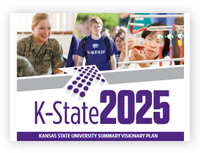 We are pleased to share with you the fifth K-State 2025 progress report. This report covers the first five years of K-State 2025, highlighting key accomplishments since the K-State 2025 visionary plan was launched under the leadership of President Kirk Schulz in 2011. Academic year 2014-15 was another record-breaking year with many advances made possible through the efforts of faculty, staff, students, alumni, donors, and partners. Each fall, the President and Provost visit the colleges and major units and highlight progress in K-State 2025 themes and priorities for the coming year.